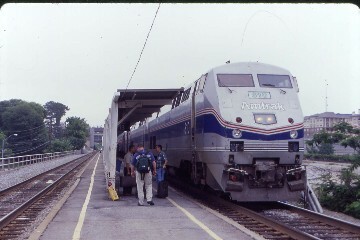 On June 10, 2001, I flew on American Airline from Orange County to Chicago O'Hare where I made an easy transfer to Union Station by taking the CTA Blue Line to Clinton Street and then walking three blocks to the Amtrak Station. As always, I ate at Gold Coast on the station's second level having two Char Dogs, which are the best tasting hot dogs that I have ever eaten. I boarded the Lake Shore Limited for New York City and rode in an Amfleet 2 Coach. We were delayed waiting on a late California Zephyr for over an hour before we added our express cars which took another 45 minutes. I was treated to a structure fire to the west while all this was going on. We finally departed the Windy City and headed east. While we were almost a full train but I managed to keep both seats to myself. After Elkhart, IN, I stretched out across the seats and slept the night away until after Erie, PA, where I awoke to a rainy morning. I walked the four blocks to my new hotel, the Herald Square Hotel and checked in for a two night stay. I took my first New York subway trip since 1971 and went to Grand Central Station for the first time. I took Metro North 2775 out to Yonkers to ride out of the great station. This was my first Metro North Trip. After 125 Street, I saw a junk yard like on TV's Stanford and Son. This is also a safe way to see Harlem. At Yonkers, I did a little railfanning even catching a pair of Metro North FL-9's. I took the Mued MN 782 back to Grand Central and saw many interesting and odd creatures on my subway trip back to my hotel where I called it a night. I awoke to a sunny day as I headed back to Penn Station to a New Jersey Transit Ticket Machine to buy a ticket to Newark on NJT Train 3703. The trip was quick and at Newark Penn Station I followed the signs that led me to the Subway which was still running with PCC Cars. I made a roundtrip and photographed the cars that we meet on the return trip. Next I took NJT 2502 into Hoboken where I photographed NJT trains, a GG 1 in Tuscan paint, the New York Skyline across the Hudson, the depot still lettered Lackawanna and the Ferry Building lettered Erie-Lackawanna. I took the joint Metro North/NJT 1 to Port Jervis, NY via the Bergen Line. Once out of New Jersey the line is quite scenic and now I know why Ross Rowland ran his High Iron Steam Trips over this line. We crossed over the Hudson Highlands, over a long high bridge and through a tunnel to reach Port Jervis on the shore of the Delaware River. The Erie Depot still stands, an Erie Caboose is on display and the turntable was also on display. 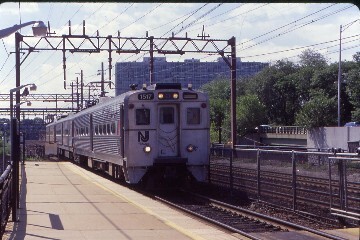 I returned to Hoboken on Train 58 which went via the Main Line through Passaic, NJ. In order to get back to NYC quicker, I took NJT 425 to Broad Street station in Newark to wait for NJT 6650, a Mid Town Direct to get me back to Penn Station. I dropped the camera off in my room back at the hotel before I took the Subway to Yankee Stadium where I watched the Montreal Expos win in the 12th Inning on a Mark Shields disputed home run. The return subway ride was uneventful and I received another good rest at The Herald Square Hotel. 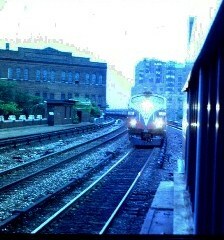 The next morning I was back at Penn Station waiting for Acela Regional 170 to take me to Boston. This trip did not go all that well. We got there, but it took four electric locomotives to do it. As the train pulled in and after I had boarded, they removed the engine that had brought the train from DC and replaced it. We left NYC an hour late and made it to the approach to the Hell Gate Bridge where it was discovered that our new engine did not have cab signals needed to operate on this section of the Northeast Corridor. We sat and waited for a rescue engine as an Acela Express passed by on the way south. We finally got moving and made it to New Haven where engines 2 and 3 were cut off and the fourth and final engine was added. Train 170 had no further delays and I detrained at Back Bay Station and walked to my new hotel in Boston, the Chandler Inn. I returned to Back Bay to photograph the T Commuter Trains and an Acela Express. I then rode the Subway from Copley Square to Kenmore where I walked to Fenway Park and watched the Red Sox lose to the Florida Marlins 4-2. I had always dreamed about seeing a game in Fenway Park and seeing the Green Monster up close which I did by sitting out in the center field bleachers. Who says that dreams do not come true? The trip back to the hotel was uneventful where I watched the Lakers win Game 4 of the NBA Finals over the Philadelphia Seventy Sixers. I enjoyed another good night rest. Up early, I took the Subway from Back Bay to South Station with no problems and waited for boarding of the Acela Express 2153. As I walked out to this new train, I showed the conductor my ticket and he sent me forward. Marty, my excellent Amtrak Agent in Santa Ana had booked me in First Class without me knowing. I was one happy train rider as I boarded. I had a single seat on the inland side of the train. The seats are just the same as our Surfliner seats back home so I felt right at home on the Acela As the train pulled out, the service started and did not stop until I detrained at Penn Station in New York. I enjoyed a French Toast Breakfast with all the tea and juice that I wanted. A newspaper was given and later a hot towel to clean up after breakfast. The ride was smooth. After Route 128 and the Canton Viaduct, our engineer opens it up and then announces that we are travelling at 152 mph which is a new personal record for me on a train. After Providence, I walk to inspect the Acela and to photograph the interior. It is a beautiful train, something Amtrak should take pride in as do the employees who work on it. I then just sat back and enjoyed the ride. What a train. All too soon we were arriving in Penn Station and I had to get off of the Acela. I detrained for a photograph, I was already thinking of when I might get back here for another ride. I took my luggage up stairs to the First Class Lounge and the headed down one level to the Long Island Railroad Ticket Counter where I bought a roundtrip to Babylon in search of Towers or Gates which there were not either. 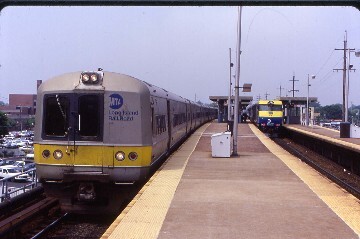 This was my first trip on the Long Island and I was abroad an eight car Mued Train. The trip was pleasant and I saw a new part of Long Island for the first time. Jamaica is one impressive place with all of the station trackage there. The route also goes through Amityville as in a certain horror movie. At Babylon one can make a connection to a train out to Montauk, a trip I will make in the future. The trip back to Penn Station already had me thinking of other trips I could make on this railroad. I am always searching for new routes to ride. I return to the Metropolitan Lounge where I watched CNN and waiting for my next departure. I took the escalator down to track 12 to board the Crescent to New Orleans in a Viewliner Room. My Car Attendant, Phillip Whitley is also going to the NRHS Convention in St Louis just like me. We hit it off really well. During the long stop in Philadelphia he shared pictures he has taken over the years. I had Prime Rib in a rebuilt dining car, as we cruised down the Northeast Corridor at speed and I detrained at Washington, DC for a few quick pictures. I turned in after Manassas and slept soundly all the way to Georgia. 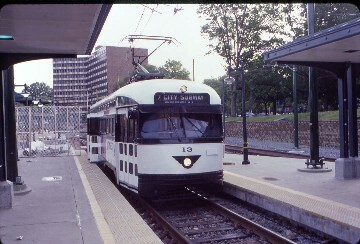 June 15, 2001 I enjoyed breakfast prior to the stop in Atlanta. I enjoyed lunch before Birmingham. The videos in room that I enjoyed were Castaway and Miss Congeniality. The trip was quiet and restful. 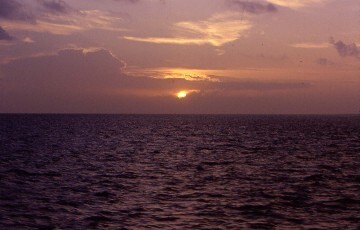 For dinner I had a delicious New York Strip which was followed by the scenic highlight of the route, a sunset crossing of Lake Pontchartrain which I also photographed. We arrived in New Orleans right on time and a quick Taxi Cab ride to the Maison Street Quality Inn allowed me to watch the Lakers win the 2001 NBA Championship. 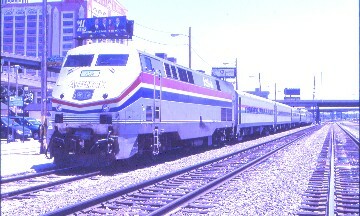 The following day found me back at Union Station as a 14 hour late 2, the Sunset Limited was getting ready to leave. After it departed, I inquired about a room on the City of New Orleans and for $75 I got a room all the way to Chicago. I waited in the Magnolia Room and watched Tiger Woods having major problems playing golf. I boarded room 4 on the City and sat back to enjoy the ride to Chicago. The tour guide p.a. announcements went all the way through the train and since I had heard it all before, my tape of Guns and Roses Live drowned it all out. I enjoyed another steak for dinner before I ventured back to the lounge car to watch Miss Congeniality again. We arrived on time and I stored my bags in a locker. I rode out to Forest Park on the CTA Blue line before I rode back into town where I transferred to the Red Line. I rode the entire Red Line. I got off at Addison Street on the return to go to Wrigley Field where I saw Sammy Sosa hit a home run and the Cubs beat Minnesota. I returned to Union Station and Gold Coast for a Hamburger before taking Metra 1315 out to Aurora where I stayed at the Comfort Inn with a track side room of the BNSF mainline. I was up early for Metra 1304, an express train into Chicago followed by a McDonald's Breakfast. 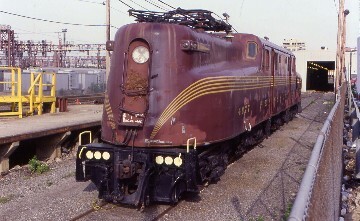 Amtrak 303 had four private cars on the rear end going to the NRHS Convention in St Louis. We departed on time but after Joliet we slowed for the first of many slow orders as they are upgrading the tracks for future high speed service. I photographed the Illinois State Capital Building in Springfield before we followed the abandoned right away of the Illinois Terminal Railway. As we neared St Louis, the Gateway Arch dominated the city's skyline as we approached and entered town via the MacArthur Bridge. We arrived almost an hour late, and after a quick picture, a man and I walked to the Metrolink Light Rail Line boarding at Kiel Center and rode one stop to Bush Stadium. We walked around to the east side of the stadium then one more block to the Millennium Hotel where my room was not ready. I picked up my NRHS Registration Materials, stored my bags and did the entire Metrolink System Light Rail System with a stop at Union Station. Metrolink is a very nice and well used system with the eastern part just opened. It connects the Airport with the downtown area, and extends well east across the Mississippi River. That night I went back to Union Station and saw Tomb Raider at the theater there. I arise early and walk the two blocks to the Gateway Arch for my first up close look at it. Returning to the Hotel, I am on the first bus to the Union Pacific 3985 Train which is waiting for us at Ewing Avenue. The Consist of our train was Union Pacific Challenger 3985, 2 Water Cars, Tool Car: Art Lockman, Tool Car: Howard Fogg, Box Car, Commissary: Sherman Hill, Coaches: City of Salina and Portland Rose, Dome Coach: Columbine, Coaches: Katy Flyer, Pony Express and Sunshine Special, Dome Coach: Challenger, Coach: Texas Express, Generator: 208 and Theater Car: Idaho. We left right on time heading to Gorham, IL on the UP Chester Subdivision. We are being well photographed as we head east through town to the MacArthur Bridge and turn south at Valley Junction. 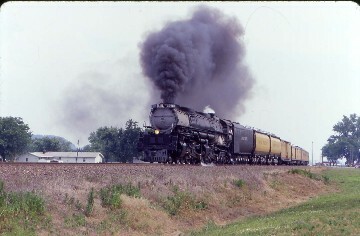 Illinois is the 6th State that I have ridden behind Union Pacific 3985 in. Once passed Dupo, you can see where the Mississippi River has flooded over the years. We passed through Valmeyer, a town that was relocated after the 1993 flood and its old location is a virtual ghost town. North of Chester we run along the river and in town stop and do Photo Runbys twice with excellent smoke. From here we ran to Gorham, where passengers were allowed to detrain out into the heat and humidity while I stayed abroad as the train was wyed. I made a smart choice from what the other passengers said when they got back on. We headed back to St Louis, making another Photo Runby in Valmeyer in perfect light. The Union Pacific and their train was outstanding and all passengers had a great trip. We arrived back in St Louis right on time and were bussed straight back to the Hotel for a well deserved rest. Another early start, we were bussed to the Wabash Live Steam Railroad which was built along part of the original Pacific Railroad right of way. Our train was double headed due to wet conditions from the previous night rain and a third helper was used being. The trip was two miles following the Meramec River along a bluff through virgin Missouri Forest. The train was wyed at the end of the line and then we returned to the bus which took us to the Museum of Transport to view their extensive collection of railroad equipment. They have 24 steam locomotives, 28 diesel/gas, 10 electric locomotives, 30 passenger cars, 24 freight cars. It was very impressive. I rode the streetcar and their miniature train. We went back to the Hotel and I took Metrolink to Union Station to photograph the Rail Cruise America Dinner Train prior to the departure for De Soto. On my way back to the hotel, a good thunderstorm took place and I used my umbrella for the first and only time on the trip walking to Bush Stadium where Sammy Sosa hit a pair of home runs, one being a Grand Slam as the Cubs beat the Cardinals before I returned to the hotel for the night. The wake up call never came and at 7:10 am I was racing downstairs for the last bus to the Frisco 1522 Train at the Amtrak Station. When we pulled up, it was pouring down rain so I took cover under the roof of the Amtrak Station. We waited for the Kansas City Mule and the Texas Eagle before our train of private cars pulled by before backing into the station. It was a mad dash to get a seat. I took a seat in the Mojave River, an ex UP car in UP paint. This train had a consist of Frisco Mountain 1522, Tool Car: Black Gold 800608, Baggage Car: Firefly 800098, Sleeper: Cimarron River 800069. Coaches: Mohave 800651, Echo Canyon 800725, Amtrak 54550, Commissary Car: 800644, Coaches: Clinchfield 800402, Powhatan Arrow 800403, NYC 38 800655, Lounge Cars: Pine Tree State 800256, Dover Harbor 800073, Kichi Gammi Club 800705, Chouteau Club 800731, Dome Cars: Mississippi River 800200, Columbia River 800031, Silver Solarium 800335 and Amtrak P32 511. We left 45 minutes late and headed out of town passing through the tunnels by the Arch on the Hannibal Subdivision of the BNSF to West Quincy. The rain continued but did not slow the chasers who were out in force to photograph the train. We crossed the Missouri River on the Bellefontaine Bridge and soon the Mississippi River came into view. This line was closed up until last week due to flooding. The Frisco 1522 is the loudest steam engine that I have ever heard. It was interesting watching the people chase our train and you could tell when we were going to get into another shower by watching them roll up their windows frantically. The rain stopped at White Rock before we pulled into Hannibal where everyone could detrain while the engine was serviced. 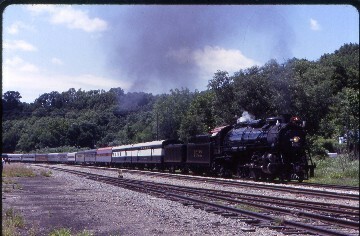 Once on the move again, we headed north to West Quincy where the Frisco 1522 and train was turned on the wye. I finally made it to West Quincy. I was ticketed to here on the Illinois Zephyr in 1993 but never made it due to the flooding of that year. We started the trip back to St Louis. 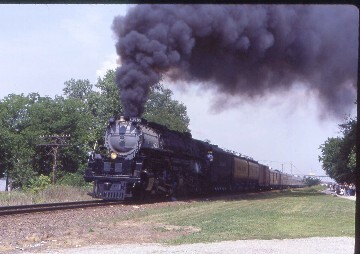 The Frisco 1522 made double Photo Runbys at Ilasco, MO. and near sundown waited for a freight at Dundee. From there we enjoyed a night time steam trip back to St Louis arriving back 3 hours late, Four of the buses had died on the service laws so I repeated my first trip to the hotel using Metrolink and I was well asleep before the rest of the group returned after a very fun day and night of riding behind the Frisco 1522. Friday was my planned rest day of the trip. I slept late, went to a seminar on the Terminal Railroad of St Louis before I took Metrolink to the Riverfront Station walk south down a road finding a Cargill Engine and a QWest Construction Train. I returned to the Hotel and attended a MKT seminar before I headed to the Arch. I had a ticket for the 12:45 tram to the top that I got on-line. The let me go up early and what a view. Everyone who goes to St Louis should go to the top of the Gateway Arch. Once back on the ground, I noticed pools of water and walking to the south end of one it was indeed what I thought. A reflective pool of the Arch and what a picture. I went back to Union Station later in the day before going back to Bush Stadium for a San Francisco Giant win including another grand slam by them and a home run by Mark McGwire for the Cardinals then back to the hotel for another full night of sleep. My final full day in St Louis starts off early once more. The bus took me to the Amtrak Station where we learned that the Texas Eagle would not be a problem as it was 5 hours late. The KC Mule left right on time and the Frisco 1522 and train backed passed the depot before pulling into the station. Mad dash 2 found me in the same car, the Mojave River, while it seemed that everyone was going to then Amtrak Horizon Car. What a thrill it must be to ride in on of those cars! We left on time, backing out then pulling forward. This trip will be on the BNSF Cuba Subdivision as far as Bundy Junction. The train slowly moved to Lindenwood Yard before it picked up any speed. We passed the depot at Webster Grove before crossing the Meramec River four times in the next 28 miles. At Allentown to the north, the train passed a Six Flags Over America Theme Park. At Rook, the Frisco 1522 performed a Double Runby. We passed through the town of Bourbon which used to be one of my favorite drinks back in my drinking days and at MP 86.8 passed through Cuba, the town which gives this subdivision its name. At Rolla, we passed sister engine Frisco 1510 on display before we descended down the west side a Rolla Hill into Newberg. The train continued to Bundy Jct where it was wyed for the return trip. 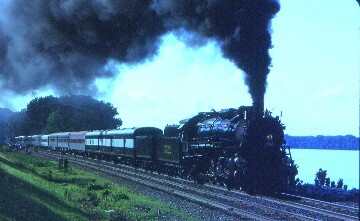 Passengers were allowed to detrain in Newberg while the servicing of the locomotive took place. That gave me time for an ice cream before the Frisco 1522 did a Photo Runby before we reboarded. The climb up Rolla Hill was spectacular and the sound of the engine even more incredible as it echoed through the cuts and off the surrounding hills. The vestibules were overflowing with people so that an Amtrak official could not make his way through the train. He ordered all the top dutch doors to be shut for the reminder of the trip. We were running so far ahead of schedule that another double Photo Runby was held in Lindenwood Yard on the shady side like the old NS steam trips. We still got back into St. Louis early and with the bus ride back to the hotel thus ended the 2001 NRHS Convention in St Louis. I went to bed right away as I had a 4:25 am train to Chicago to catch in the morning. With three missing wake up calls, poor elevator service and a call last night to the front desk advising them of my 3:15 A.M. departure, you think my bill would be ready. Nope, they did not even have my last night stay ready. The only thing this hotel has going for it is the location. I taxied back to Amtrak and boarded a horizon coach where I slept until Springfield. From there, I just watched the Illinois countryside pass outside my window. We had all the slow orders and arrived back in Chicago 55 minutes late. I went to Gold Coast for a Char Steak Sandwich before walking back to the Blue Line Stop on Clinton for the trip back to O'Hare to board American Airlines for the most bumpy flight of my aviation career back home to Orange County Airport where my Webmaster Jeff picked me up and took me home. Note: This was the first story I ever wrote for this web site as I just had gotten my first computer after I got home from the 2001 NRHS St Louis Convention.